The rich history of our border communities is expressed through architectural forms that pre-date the coming of the railroads in the 1880s. Places like El Paso and Laredo were transformed by the availability of pre-cut lumber, cast iron, and decorative building materials that were widely available once trains connected these remote places. As they grew, pre-railroad vernacular adobe and stone structures were destroyed, and the vernacular buildings traditions lost. Yet in places like El Azteca in Laredo and Segundo Barrio in El Paso, pre-railroad architecture and traditions hold their own. They need to be documented, maintained and preserved. A late-19th century neighborhood with early adobe buildings in downtown El Paso would benefit from more detailed documentation, research and legal protection, inspiring heritage tourism in a remarkable city. 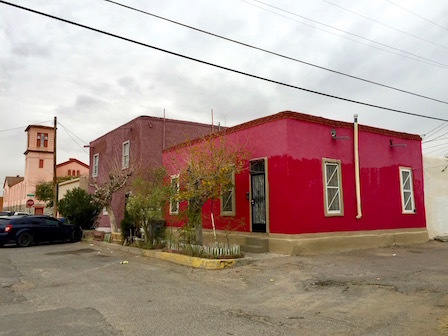 After El Paso City Council rejected grant money to fund a downtown historic structures survey in 2015, local advocates secured County funding for the survey. It will document the diverse historic architecture of downtown El Paso including the Caples Building (1909) and El Segundo Barrio.